I created this layout based on the photo. It is not my photo and strangely enough, I had only met the lady the day before that it belonged to. I met Anthea at a scrapbooking retreat. I saw this photo of her daughter, Tori, sitting on her desk and I commented how much I loved it. Then at lunch I sat across from Anthea and I heard the story behind Tori and the photo. Tori was chosen to be the face of the Ghost campaign. Ghost Campaign is a bullying awareness cause creating a space for the youth to share their personal experiences. What’s Tori’s connection to this campaign? She has achondroplasia – a common form of Dwarfism. Something about Tori’s story and her mum connected with me and I found myself later asking if I could scrap this photo. Thankfully she said “Yes”. Today it’s my share on the Imaginarum Designs blog. 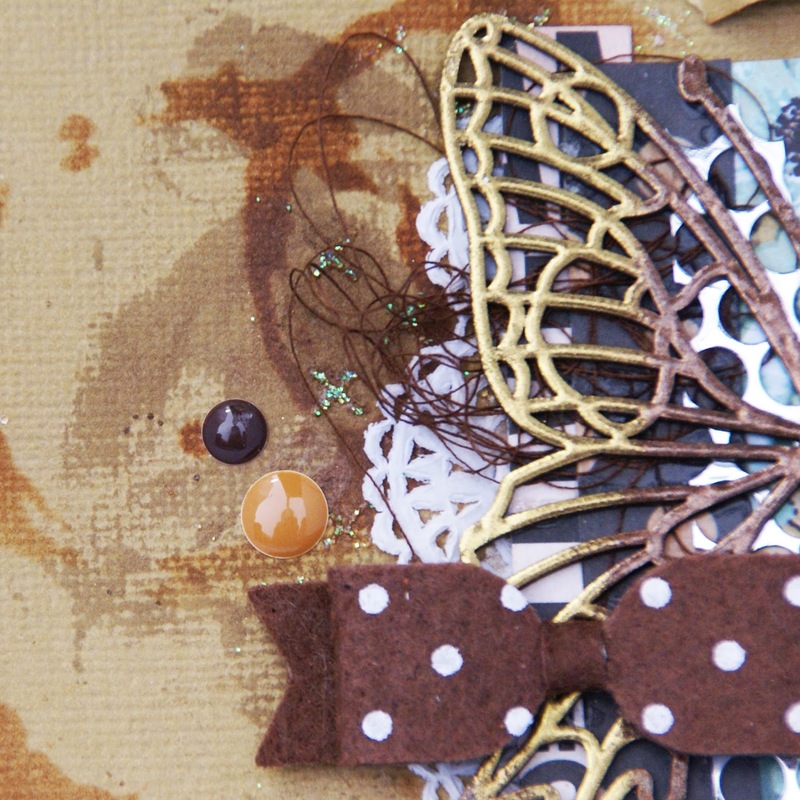 As you all know, I am all about the mixed media and the application was where I was inspired by Fiona. The inks are splatted and dabbed into concentrated areas to create “islands”. Here is a close up. Head over to the Imaginarium Designs blog to read about it. 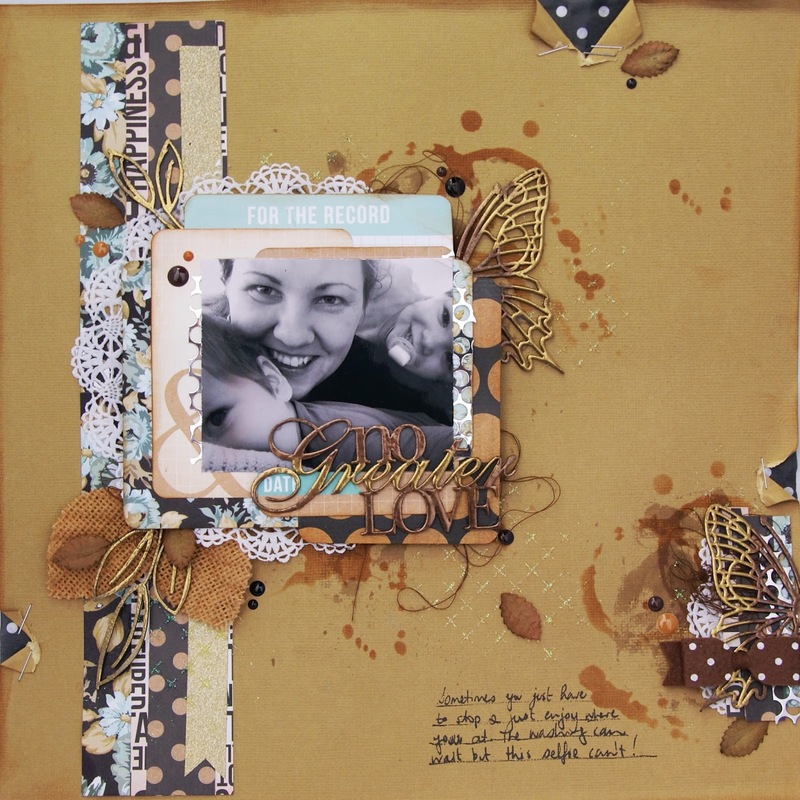 Today I am sharing a layout I create for Imaginarium Designs. This layout was all about embossing. I used a lot of the Colour Blast embossing powders to create some awesome colours on my chippy. How freaking cute is that little robot and his bow tie! This layout I created for a Guest Design Spot with Rainbow Splendour but I liked it so much I submitted it to Scrapbooking Memories Magazine. It was picked up for publishing so I had to create another for Rainbow Splendour. Imagine my surprise when I received a message from my friend Sue Plumb telling me the cover of the next issue of Scrapbooking Memories Magazine was pretty awesome. I had no idea it was on the cover!! The bow tie is from D-lish Scraps. I used my Stash of Cocoa Vanilla Papers that I won a while a go with the intention to scrap some boy photos but I hadn’t yet had a chance. I really enjoyed putting this layout together and to be honest it was quick and easy. There is also some Charms Creations DIY handmade Embellishments in there too. I kept them au naturale. There is also a process video up on the Popleopod YouTube channel so make sure you check that out. Posted on September 4, 2016 August 23, 2016 Categories Charms Creations, Craft, Crafts and DIY, D-lish Scraps, Guest Designer, Mixed Media, Scrapbooking Memories MasterTags artsandcraft, craft, creating, layout, paper, papercraft, scrapbook, scrapbooker, Scrapbooking, scrapbooking layout, scrapbooklayout, scrapping, youtubeLeave a comment on Scrapbooking Magazine COVER LAYOUT!! 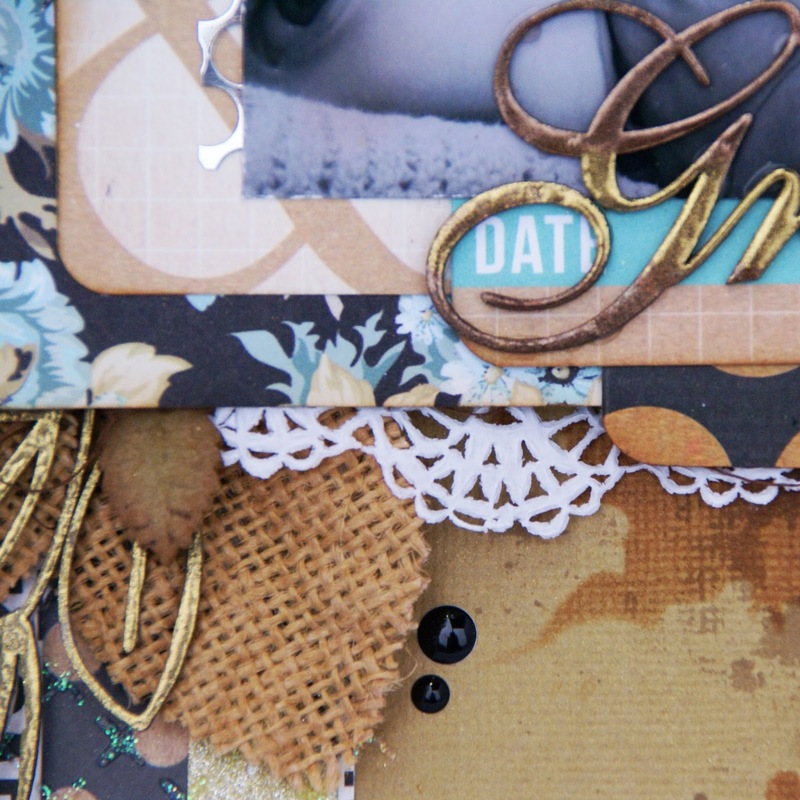 Today I am sharing a layout I created for Imaginarium Designs using Project Life cards. This was shared in July and I’m not sure how I missed sharing it here. I have decided I am not a Project Lifer but I have a whole heap of cards that are too pretty to waste. So, I set about finding new uses for them. How awesome does the Imaginarium Designs Chippy look all “pretty” up with Colour Blast Embossing Powder. I embossed all the chipboard a few times to create a nice bold glossy coverage. To get the two toned effect, I just added a sprinkle of a second colour while the first was still sticky and then heated it. The Colour Blast embossing powder blend and melt nicely together without going mucky. Plus you don’t need to prep your chipboard in any way. The colour goes on vibrantly and doesn’t absorb into it in any way. 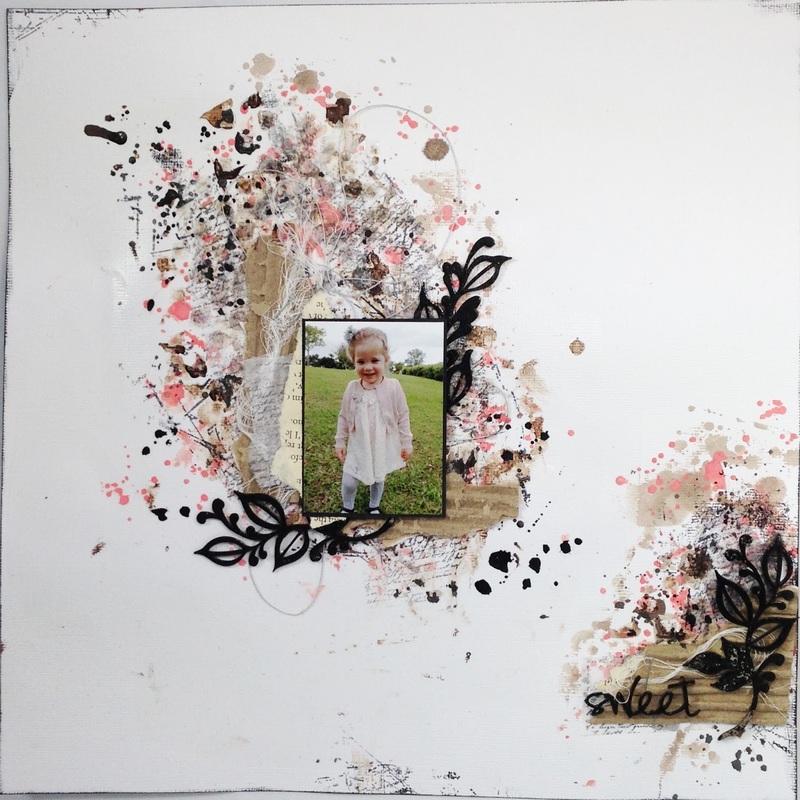 This month over at Scrap the Girls DT member Rikki has worked her magic and come up with a beautiful moodboard. I drew inspiration not only from the colours but the Wish in the centre, the sparkle of the chandeliers and the patterns of the mandella on the tip right hand side and this is what I came up with…. There is a lot of layers in this layout. I started off with a light blue piece of pattered paper from my stash that had some dandelions and the word wish already printed on it then I added texture and colour. There is lots of layers of blue inks and texture paste. 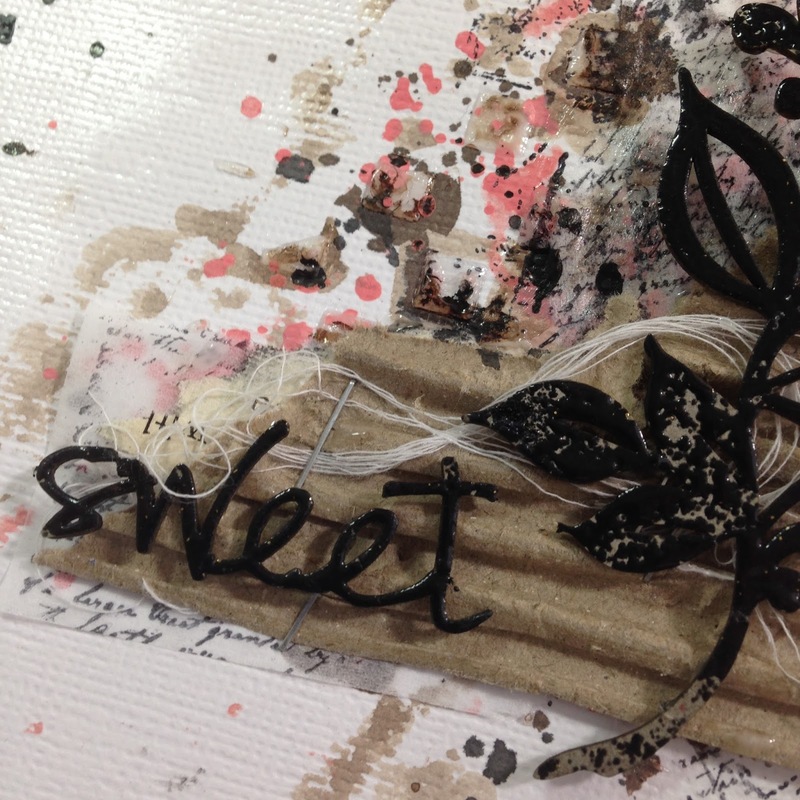 Once I was happy with my colour and texture, I added some stenciling and stamping. Then I added layers of blue embellishments. There is coloured cheese cloth, coloured crochet doilies, coloured Imaginarium Designs Chipboard, coloured Paper doily, thread and papers. Once I was happy with all the placement. I added layers of different size and coloured blue glitter, oh and some micro beads too for even more texture. As a final touch, I added some old Kaisercraft rub on’s that have been sitting in my stash. To break away from the blue just a touch I added a photo tab and cut frame from Flutterby Designs. There are just nice little touches that work well with the layout. The photo worked perfectly with the moodboard too! This month I was asked to be a Guest Designer over on the Kraft + challenge blog on behalf of Flutterby Designs. This challenge was all about Jigsaws. So, I had this idea that I could include actual jigsaw pieces in my layout. So, I went and bought myself a $5 jigsaw thinking I could just grab a handful and jam them together and it would look fine. Nope, I was wrong. There is no way you can get them to fit together nicely without putting the puzzle together. I usually work weeks ahead of deadlines but a crazy month saw me sitting down to this challenge 3 days before it was due. I was faced with the challenge to scrap the idea or put the puzzle together. It wasn’t a small puzzle either 1000 pieces. So, I spent 2 hours pulling out all the edges and corners and then some similar colours. I managed somehow to find enough matching pieces to make it work without having to complete the whole thing. Once the puzzle was sorted, I coved the pieces in three coats of gesso and then hand painted each one with Flutterby Designs Flutter Paint. Thankfully this paint has good body and it only took two decent coats to get the colours looking vibrant and solid. Then it was a matter of putting the layout together. It was a crazy idea that paid off I think. Here is my process video over on my YouTube Channel POPLEOPOD.